In 641, after marrying Princess Wencheng, Songtsen Gampo decided to build a grand palace to accommodate her and let his descendants remember the event. However, the original palace was destroyed due to a lightening strike and succeeding warfare during Landama's reign. 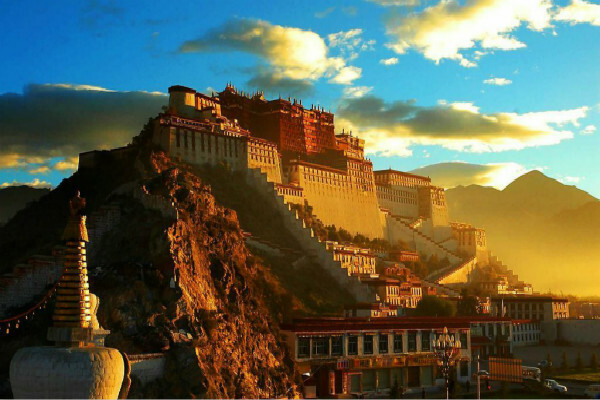 In seventeenth century under the reign of the Fifth Dalai Lama, Potala Palace was rebuilt. The Thirteenth Dalai Lama expanded it to today's scale. The monastery-like palace, reclining against and capping Red Hill, was the religious and political center of old and the winter palace of Dalai Lamas. The palace is more than 117 meters（384 feet）in height and 360（1180 feet）in width, occupying a building space of 90 thousand square meters. 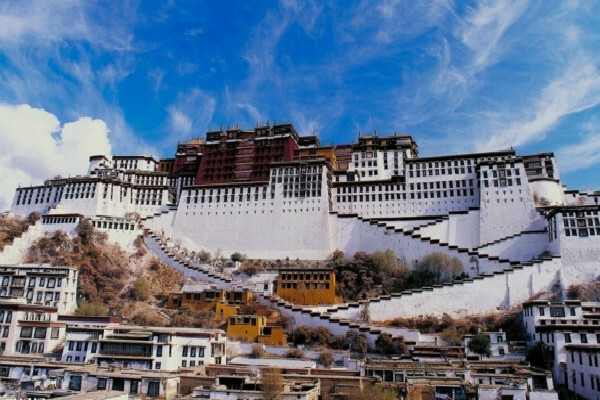 The Potala is composed of a White Palace and Red Palace. The former is for secular use while the later is for religious. The White Palace consists of offices, dormitories, a Buddhist official seminary and a printing house. From the east entrance of the palace, there are painted images of Four Heavenly Kings, while a broad corridor upwards leads to Deyang Shar courtyard, which used to be where Dalai Lamas watched operas. Around the large and open courtyard, there used to be a seminary and dormitories. West of the courtyard is the White Palace. There are three ladder stairs reaching inside of it, however, the central one was reserved for only Dalai Lamas and central government magistrates of Tibet. In the first hallway, there are huge murals describing the construction of Potala Palace and Jokhang Temple and the procession of Princess Wencheng reaching Tibet. On the south wall, visitors will see an edict signed with the Great Fifth's handprint. The White Palace mainly serves as the political headquarter and Dalai Lamas' living quarters. The West Chamber of Sunshine and the East Chamber of Sunshine lie as the roof of the White Palace. They belonged to the Thirteenth Dalai Lama and the Fourteenth Dalai Lama respectively. Beneath the East Chamber of Sunshine is the largest hall in the White Palace, where Dalai Lamas ascended throne and ruled Tibet. The Red Palace was constructed after the death of the Fifth Dalai Lama. The center of the complicated Red Palace is the Great West Hall, which records the Great Fifth Dalai Lama's life by its fine murals. The scene of his visit to Emperor Shunzhi in Beijing in 1652 is extraordinarily vivid. It also has finely carved columns and brackets. The hall has four additional chapels. The West Chapel houses three gold stupas of the Fifth, Tenth and Twelfth Dalai Lamas'. Their mummified and perfumed bodies are well kept in those stupas. Among the three, the Fifth Dalai Lama's stupa is the biggest, which is made of sandalwood, wrapped in gold foil and decorated with thousands of diamonds, pearls, agates and others gems. The stupa, with a height of 14.86 meters (49 feet), is surrounded with more than 3,700 kilograms of gold. The North Chapel contains statues of Sakyamuni, Dalai Lamas and Medicine Buddha, and stupas of the Eighth, Ninth and Eleventh Dalai Lamas. Against the wall is Tanjur (Beijing edition), which is a most important Tibetan Buddhist sutra sent to the Seventh Dalai Lama by Emperor Yongzheng. In the East Chapel a two meters (6.5 feet) high statue of Tsong Khapa, the founder of Gelugpa, which is Dalai Lama's lineage is enshrined and worshipped. In addition, about 70 famous adepts in Tibetan Buddhism surround him. The South Chapel is where a silver statue of Padmasambhava and 8 bronze statues of his reincarnations are enshrined. On the floor above, there is a gallery which has a collection of 698 murals, portraying Buddhas, Bodhisattvas, Dalai Lamas and great adepts and narrating jataka stories and significant Tibetan historic events. West of the Great West Hall locates the Thirteenth Dalai Lama's stupa hall. Since he was regarded as great as the Great Fifth, people started to build his stupa after his death in the fall of 1933. Taking three years, the stupa is comparable with the Great Fifth's stupa. It is 14 meters (46 feet) in height, coated with a ton (2200 pounds) of gold foils. In front of it is a mandala made of more than 200,000 pearls and other gems. Murals in the hall tell important events in his life, including his visit with Emperor Guangxu. 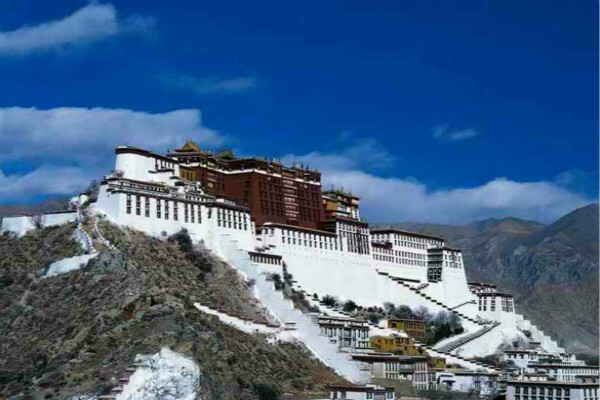 The highest hall of Potala was built in 1690 and was used to be the holy shrine of Chinese Emperors. Dalai Lamas would come here with his officials and high lamas to show their respects to the central government annually before. Dharma Cave and the Saint's Chapel are the only structures left which were built in seventh century. They both lie central of the Red Palace. Dharma Cave is said to be the place where King Songtsen Gampo preceded his religious cultivation. Inside the cave, statues of Songtsen Gampo, Princess Wencheng, Princess Tritsun and his chief ministers are enshrined. In the Saint's Chapel above Dharma Cave, Chenrezi, Tsong Khapa, Padmasambhava, the Fifth, Seventh, Eighth and Ninth Dalai Lamas are enshrined and worshipped. Visitors may find a stone with a footprint that was believed left by the infant Twelfth Dalai Lama.